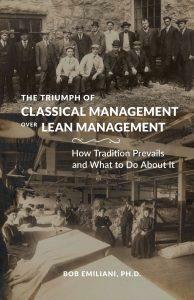 This is the back story to the book The Triumph of Classical Management Over Lean Management. After 30 years of effort by Lean’s creators and its dedicated practitioners, we still find widespread disinterest in Lean management, in its full form, among executives of large corporations. Success with Lean has been more common with mid-size and small companies. However, when one realizes the huge number of mid-size and small businesses in existence, the uptake of Lean management is minuscule. Why? Is there is something fundamentally wrong with Lean management that turns executives off? Is it too hard to understand and practice? How so? Do executives have different mindsets and better methods for achieving their objectives? What is it about those mindsets and methods that make them better than the Lean mindset and methods? Questions like these have been present since the inception of progressive management over 100 years ago. These were questions that I could not let go of, and have been part of my long-term study of Lean leadership and Lean management. I wanted to answer these questions and solve this important problem, primarily to help people in their efforts to advance Lean management. However, the existing mindset proved incapable of solving the problem of executive disinterest in Lean. So, I set out to create a new understanding of the problem and develop new practical insights using a combination of historical, ethnographic, descriptive, and causal research methods. In addition, I made use of my two decades worth of experience with TPS and Lean in my capacities as a practitioner, educator, and executive trainer. The result is a book that finally solves a problem that has been around for more than 100 years. A Lean “insider” had this to say about Triumph of Classical Management: “…it is the most important lean book ever published because we now clearly understand the CEO audience to whom lean is directed. If the book had been written right after The Machine that Changed the World [in 1990], the approach to lean training and marketing would have been completely different.” (name withheld by request). I hope you enjoy this book and that it inspires you to find new and more effective ways to advance Lean management. You are always going DEEP Bob, I love it for the betterment of organizations and the betterment of the people in those organizations. We applaud you!! And the new book. Thank you Karl. I do hope my recent work proves to be helpful to people. I read with utmost interest your extremely valuable research on causes of Lean implementation failures. In this respect I was wondering if what you mention in your article on Lean implementation as a political issue, about closing off the four techniques of wealth creation relates to the four steps of (1) setting a goal, (2) writing it down, (3) sharing it, and then (4) being smart (specific, measurable, agreed upon, realistic and time based)? Hello Samir – I think those 4 steps can still function either personally or organizationally. They are not closed off. Though the methods that CEOs use for wealth creation are usually set up executed differently than the 4 steps you outline.